Thailand’s leading manufacturer of toothbrushes and household brushes is committed to producing toothbrushes of the highest quality. 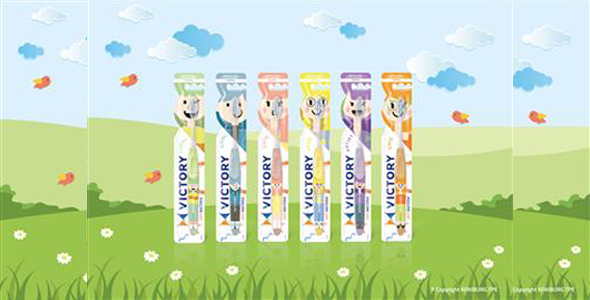 For this reason, The First Thai Brush Co., Ltd. has chosen a high-quality thermoplastic elastomer from KRAIBURG TPE to enhance the ergonomics and functionality of its Victory toothbrush product lines with a soft-touch grip. Thermoplastic Elastomers (TPE) have become important components in the manufacture of consumer products. When The First Thai Brush decided to redesign the handle of its Victory toothbrushes, they were looking for a flexible material with food-contact approval, superior design freedom and efficient processability, including compatibility with other plastics in a co-molding process that would not require a bonding agent to ensure long-term adhesion. Moreover, ergonomics are key when it comes to designing high-quality functional toothbrushes. The use of an elastomeric material for the brush handle provides a pleasant soft-touch and non-slip grip which helps users achieve optimal cleaning motion with less pressure. In close collaboration with KRAIBURG TPE, The First Thai Brush selected a high-transparency food-contact grade from the THERMOLAST® K range of consumer care compounds that also delivers a smooth silky surface finish and offers the perfect balance between flexibility and hardness to obtain the desired haptics. In addition, the material combines high flowability and excellent adhesion to polar thermoplastics, such as PC, ABS and PETG, with superb colorability for versatile promotional effects. Together, these properties offered The First Thai Brush virtually unlimited possibilities in design, form and function to communicate the unique features of its Victory toothbrushes and enhance the experience of consumers.